TrafficBoost will remain active for 100 or 200 unique visitors per boost credit applied or 30 days, whichever occurs first to deliver the maximum number of visitors to your job posting. How much does ZipRecruiter TrafficBoost cost? ZipRecruiter TrafficBoost is just $199 per single boost and $299 for a double boost. You activate a TrafficBoost from your Requisition page in iRecruit by selecting Advertise Requisition, and then selecting if you would like to post for free, or use a TrafficBoost. You can pay by credit card. iRecruit’s ZipRecruiter integration,makes it easy for you to get candidates quickly whether you post for free, or use the TrafficBoost option. We recommend creating and using a short application form for your ZipRecruiter applications to keep the apply process short and quick. 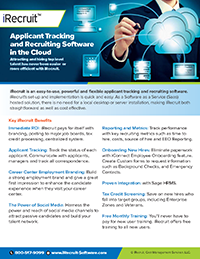 This entry was posted in iRecruit Blog and tagged applicant tracking, ats, iRecruit, job advertising, traffic boost, trafficboost, What is a ZipRecruiter TrafficBoost?, ziprecruiter. Bookmark the permalink.